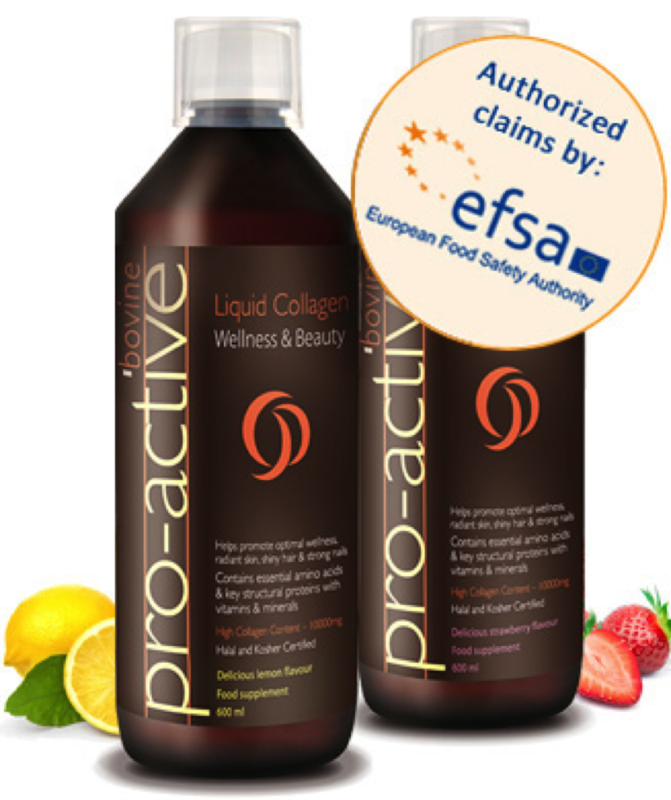 Pro-Active porcine liquid collagen is a unique dietary supplement of a premium Hydrolysed Collagen, rich in specific amino acids that are easily absorbed by the human body. Most people respond positively to the product even before consuming the first bottle, that is about a month or soon after the beginning of the second month of product use and results in such a few days are amazing. However, not all individuals have the same results at the same time period since there are many factors that affect the wellness of the skin such as genes, lifestyle, diet, extensive sun exposure, smoking, etc. In order to get best results 20ml daily – continuous use is recommended for optimal benefit. As we continue to lose 1, 5% of our Collagen per year from age 25 – continued use is recommended. The enzymes in our stomach breaks the hydrolysed collagen down into smaller peptides and free amino acids which are then easily absorbed in the small intestine before passing through the small intestine walls to reach the blood stream supplying the dermis & the body. Then, they activate the fibroblast cells to make new collagen. Aside from being easier to swallow, a liquid is readily absorbed as soon as it enters the stomach. Each daily dose of Collagen Pro-Active contains 10,000 mg of hydrolysed collagen, which is at least 50 times more efficient and effective than a common collagen pill. Collagen Pro-Active contains fructose, in order for diabetics to be able to consume the product. By definition Fructose, (a kenotic monosaccharide) is a natural sweetener found in most plants, distinguished from sucrose, a disaccharide, which is the table or granulated “sugar” most commonly used as food. Fructose can be consumed by Diabetics18. Any Food Supplement intake cannot be consumed unless strictly indicated & confirmed by the Doctor. Common structural property of collagen is the presence of three polypeptide chains that form a helix. A single collagen fibre comprises of multiple triple helices. There are several types of collagen in the human body. The most common are Types I, II & III, which are found in skin, tendons, joints, cartilages & blood vessels. As we age, our organism tends to produce less collagen at a declining rate of about 1, 5% per year from the age of 25 onwards. As a result, bones lose density, joints become more rigid, hair volume decreases, skin elasticity lessens and muscles weaken. The number and activity of skin cells (fibroblasts) that produce collagen, decreases. As fibroblasts become less active, the collagen matrix which provides skin firmness and structure, starts to break down. Skin then becomes dehydrated and thinner, plus, fine lines, wrinkles and deep furrows start to appear. 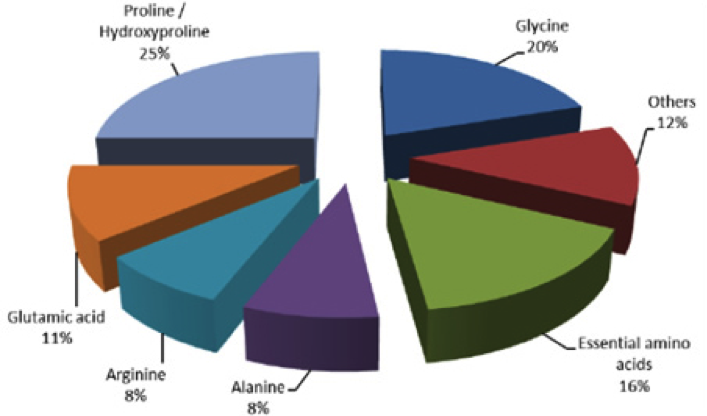 Clinical studies have shown that the percentage of bioavailability is more than 90%¹,². Oral administration of hydrolysed collagen is absorbed within the first 12 hours from the intake. 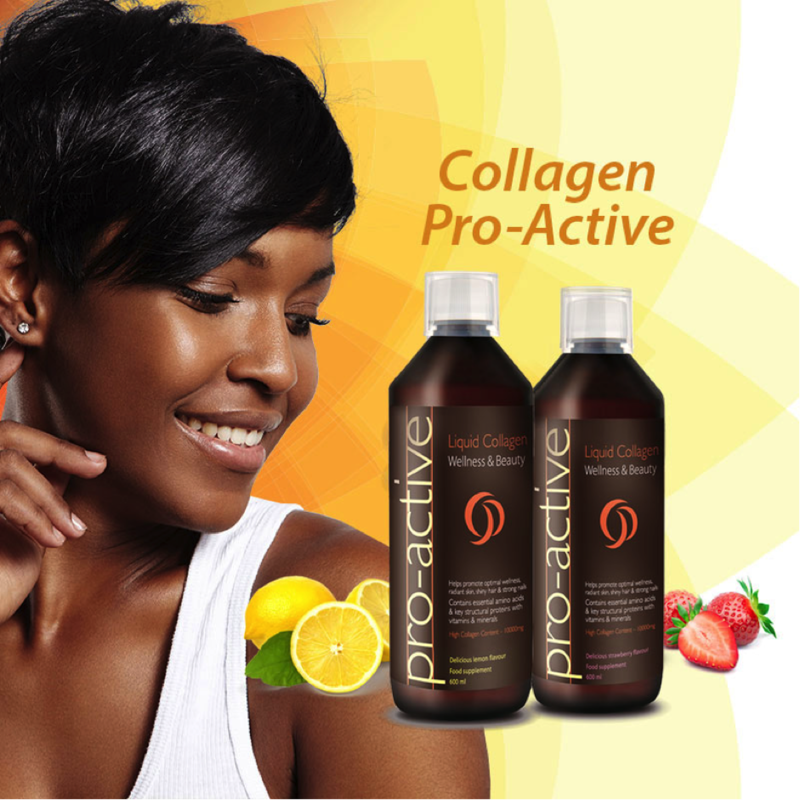 Collagen Pro-active provides benefits for the hair as well. It is clinically proven that the hydrolysed collagen in Collagen Pro-active enhances hair strength and appearance. Collagen Pro-Active increases the density of the fibres and fibroblasts, which are the principal cells of the skin and are responsible for the production of collagen. Collagen Pro-Active once absorbed by the small intestine is distributed from the arteries to the deepest layer of the skin, leading to fibroblast proliferation and increased collagen production. With daily use of Collagen Pro-Active, the skin becomes more hydrated. Collagen is an excellent form of protein as it contains 8 out of the 9 basic amino acids. Intense exercise destroys protein in the body making their replacement very important. Collagen Pro-Active also contains glycine and arginine that play an important role during exercise, providing energy to the body and thus improving athletic performance. In addition, hydrolysed collagen contributes significantly to the rapid restoration of tissue, ligaments and cartilage, and muscle post injury.